Bonnie Adama has created a rich resource of 161 games proven to help your second grader learn basic math skills. With these skills, your child will be well on their way to success in 2nd grade math. Get Close to 100 is a great game for second graders. It helps children practice double-digit addition with special emphasis on understanding place value. The object of the game is to make a two-digit addition problem that comes as close to 100 as possible. Shuffle cards and place them face down in a pile. Player #1 turns over 4 cards and moves the cards around until he/she has created a two-digit addition problem whose sum will be as close to 100 as he/she can make it. You can go over 100. Player #1 records this problem on his/her recording sheet. Player #2 checks for addition accuracy. 47 + 52 = 99 is the closest that he/she can get. Player # 2 draws four cards and does the same. 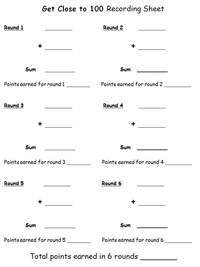 The points for each round are the difference between their sum and 100. Example: A sum of 95 scores 5 points and so does a sum of 105. Players compare scores at the end of this first round. They put their four cards in a discard pile and player #2 begins first and turns over four more cards for the second round. After six rounds, players total their points and the player with the lowest score wins. Help your child succeed in school. We will show you how!